September is over, the month of fashion weeks has come and gone... In contrast to previous spring collections there was a move away from minimalist tendencies to a more fun direction for next summer. So with the shift, what trends should you invest in now that you’ll be able to wear later? Splurge on existing trends that will still remain current for seasons to come. 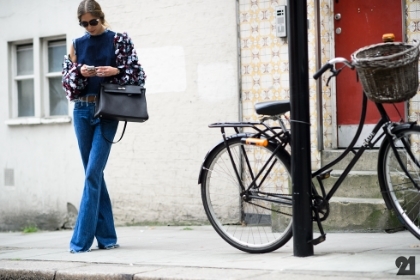 Nothing creates an instant 70s look more than swapping your skinnies for a wide leg jean. They are a 70s staple, but this season they get a modern update. Try this trend; it was an influential colour of the 1970s. Keeping with the 70s vibe, florals are appliquéd flowers, delicate beading, embroidery and pattern. A key fabrication of the 70s, reinterpreted this season in coats and jackets. Save on trends that may only last you one season! This season choose a gingham garment in a modern silhouette. The update? They were flouncy and feminine in ultra girly styling. If this trend is for you, it’s time to get used to the idea of showing a bit more skin next season.